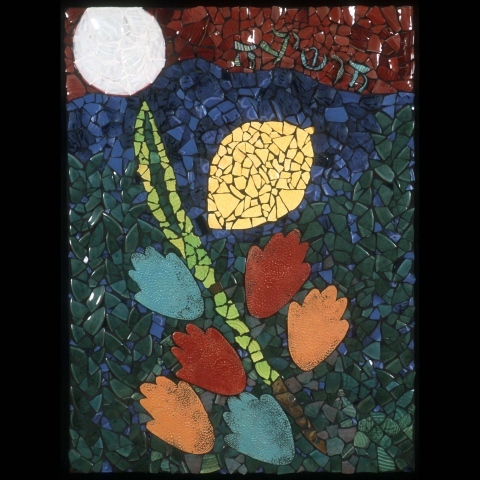 This mosaic contains the four species of Sukkot. The sukkah made of myrtle, the lulav made of palm and willow, and the etrog. The sukkah is in the mountains, illuminated by the full harvest moon. Many pairs of hands of the joyous celebrants are raised toward the heavens while the word Hoshiash (saves us) floats above the lulav and the etrog. The mosaic is created from handmade ceramic shards, handmade blown glass shards and sanded grout. According to Issac Luria, “tikun” is restoration of balance; therefore mosaics are restoration of balance and healing the world. I, too, am inspired by found objects and shards (of once beautiful objects) which create new images and become whole.